Earlier this week I cleaned out the “dogs’ bathroom.” I kept all their towels and junk in the vanity in the big bathroom (so called because it’s bigger than the master bath, not that it’s particularly large). It was a trip down memory lane, dog dishes that I had meant to donate to a rescue group, shampoo bottles with varying states of fullness, brushes, old bandanas that they wore home after visiting the groomer and the ugly pink collar Dudley was wearing when I brought him home. With a few exceptions (I will take those dishes to a rescue group) I tossed it all. Most everything was junk, but I did save a few of the less ratty towels because even if you don’t have dog paws to wipe, sometimes you need old towels that you don’t mind sacrificing for the greater clean. I find their old dog tags in drawers and other places around the house that I keep, but other than pictures there’s not a lot of memorabilia of theirs that I kept. I have paw prints of both dogs that I kept and their ashes. I keep the urns with their ashes on a hutch in the living room where they can look out the window and scope out the neighborhood. 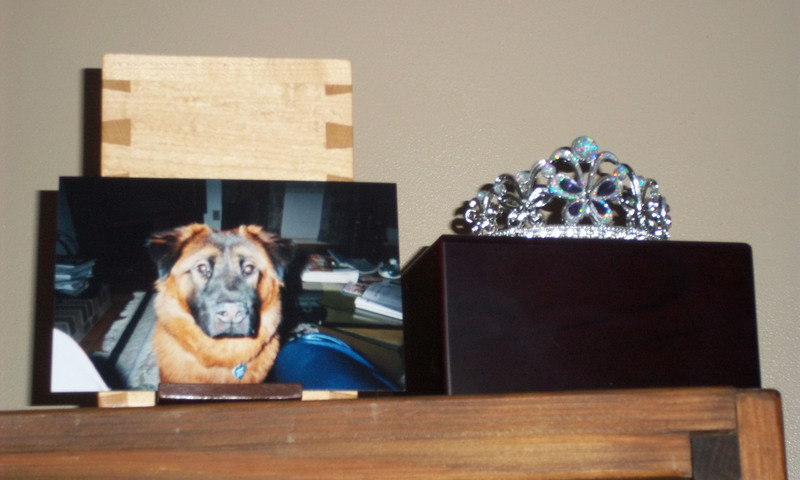 Zoe’s urn came from Faithful Friends, and I keep a crown on it because she was afterall, the Z-Queen. Dr. Brian Lapham who used to take care of both Dudley and Zoe made Dudley’s urn and there is a little shelf to put a picture. I asked Dr. Lapham to make Dudley’s urn when I learned his cancer had returned in April 2011. It turned out to be one lucky urn because we didn’t use it for 19 months. You can see a selection of Dr. Lapham’ s custom made pet urns here. I like having their urns out where I can talk to them and I talk to them both every day. I tell myself that Dudley and Zoe are the only two dogs where I’ll have their ashes returned to be scattered with mine when it’s my time to go. But I bet when that time comes, the ashes of every dog I own between now and then will be sitting on a mantle somewhere. I do hope that’s a long, long time from now! 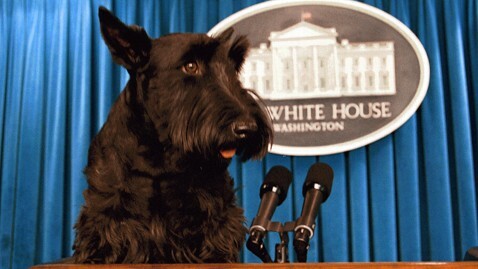 Belated condolences to the Bush family on the loss of Barney the Scottish Terrier that presided over the White House during President George W. Bush’s administration. He may have been First Dog, but he heisted his leg same as every other boy dog. This entry was posted in Uncategorized and tagged animals, canine, dogs, Dr. Brian Lapham, Dudley, Faithful Friends, Southpoint Animal Hospital, urns, Zoe. Bookmark the permalink. I love your Z-Queen’s tiara. It is quite lovely, and my human mommy completely understands wanting to have Dudley and Zoe close by and talking to them. Sheffield was my human mommy’s first dog that was “hers” as an adult. He approved of my human daddy, so my parents were married many years BHL (Before Harper Lee). Sheffield had big-dog-attitude, despite his small size. His ashes are in a little ceramic urn that looks like a martini shaker and he sits on a shelf in the den next to a decanter of Scotch. Perfect for Sheffield! My late sister Lexi and Talbot, the Golden Retriever who preceded me, are on a shelf in the study . . . perfect for watching their humans toil. It is so great to find someone who truly appreciates tacky adornments! If your human mommy and daddy ever invite someone named Keith Richards to your house, you keep a close eye on him around all those urns filled with ashes. Very funny! We’ll also try to keep him from climbing any trees.